I wish I were Amish. Except with electricity. And cars. And without the clothes and super strict rules. And I don't think I could learn Pennsylvania Dutch either. Ok, so I actually just want to be Amish for the food. It's like a 24/7 diet of comfort food! What's not to love about that? Besides all of the calories of course... But having delicious treats like homemade bread and pies every day instead of saving them for special occasions would be amazing. When a craving for something super sweet and comforting (and yes, super unhealthy) hits, where better to look for inspiration than the Amish? And in this case, the traditional Amish treat of Whoopie Pies was the perfect choice. I know Whoopie Pies have been trending for awhile now, so it may appear I'm jumping on the bandwagon a little late. But I was actually ahead of the game for once on this trend! I have a binder full of recipes that I made when I was about 9 or so. I wrote down a recipe for Whoopie Pies way back when, and 16 years later, I'm finally getting around to making them! to whoever created these! They are so good! 1. Preheat oven to 375º and grease baking sheets. 2. Cream together shortening, sugar, and the egg. 3. In a separate bowl, combine the flour, cocoa, baking soda, and salt. 4. Add the flour mixture to the shortening mixture alternately with the milk and vanilla, mixing well after each addition. 5. Drop by spoonfuls on the sheets and bake for 10 minutes. 6. Remove to a wire rack to cool completely. 7. Spread about a tablespoon of filling (recipe below) onto half of the cooled cookies and top with the remaining cookies. 2. Mix in the remaining ingredients. If frosting it too thick, add more milk. If it's too thin, add more powdered sugar. These are obviously not your everyday cookies, as they are pretty unhealthy. But they make an amazing treat. And while the people you serve them to may not shout "whoopie!" upon seeing them, they will definitely love you for making them! I'll stick with my modern life for now, as long as I can still occasionally be Amish in the kitchen! Um, those look and sound AMAZING. I bet if we had to milk cows and churn butter and all that Amish stuff, the calories wouldn't matter at all. But then, we'd have to milk cows. It's a trade-off! Those do look very inviting. Yum! I remember when I was younger driving through PA one time through an Amish community. Of course in a car we stuck out like a sore thumb. Such a simple life but yet not very simplistic. New follower from Sundae hop. Your Whoopie Pies lok yummy yummy! Those look DELICIOUS! 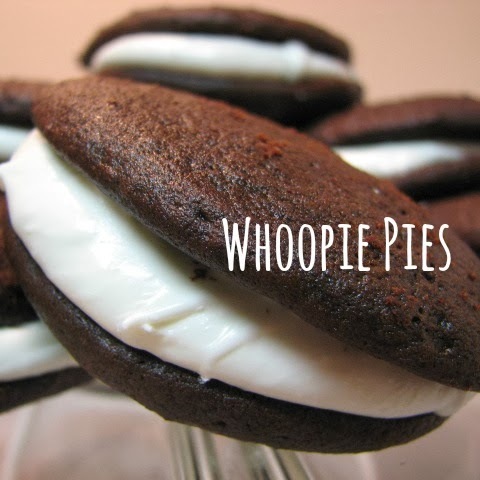 I love, love, love whoopie pies - and typically buy them from Trader Joe's. I might actually try to make some as your recipe looks easy to follow. Bookmarking for later!